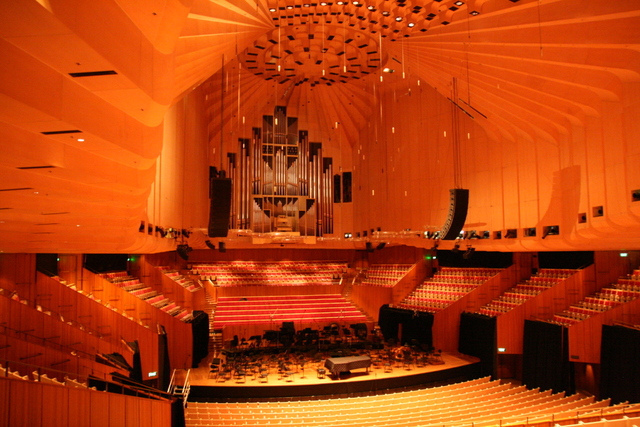 The grand organ concert hall at the Sydney Opera House is a sight to behold. That gorgeous baroque style organ is also the world's largest mechanical tracker-action pipe organ. What you see here is only the tip of the proverbial iceberg - most of it is hidden behind. With about 10,500 pipes, I can only imagine what the full resonance of the music will be like when it's being played. 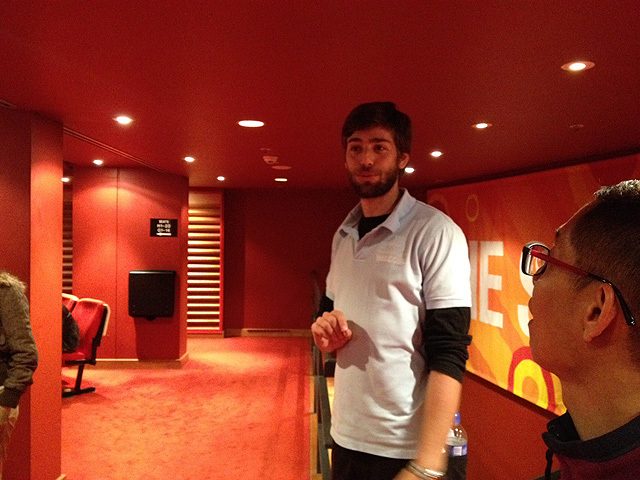 We had a most informative tour of the Opera House and our guide was full of amazing facts and figures about the iconic structure, its history, construction and operations. Did you know there's more steel inside the concrete of the Opera House than the entire Sydney Harbour Bridge? Yes, they need that much to support all those domes. These chairs look pretty new, don't they? Well, guess what - these are the very same chairs that's been installed since Day 1 - only the upholstery has been changed. They are also designed to absorb or reflect the acoustics the way a human being would if one were seated in the chair. 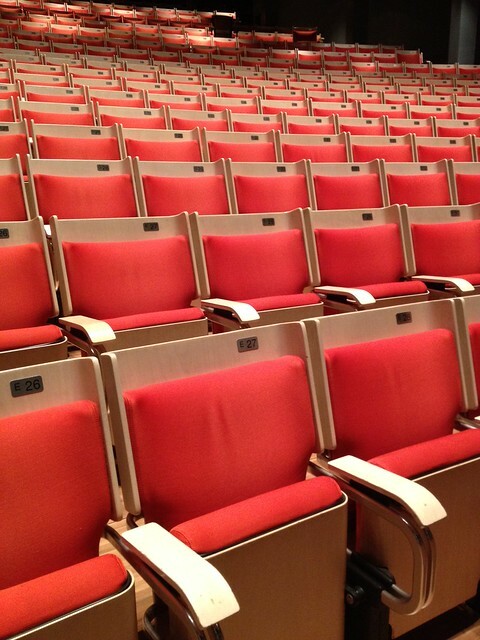 So the sound will be uniform, even if some seats are empty. The beautiful domes become a canvas at night for VIVID Sydney. 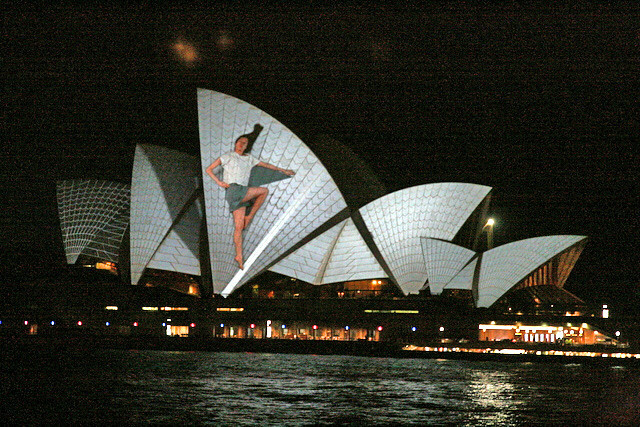 Huge moving 3D mapped projections are cast from across the harbour onto the Opera House roof. Did you also know that the tile patterns on the roof and wall surface were inspired by the print on a woman's bikini? Looking at those curves, I can understand why. 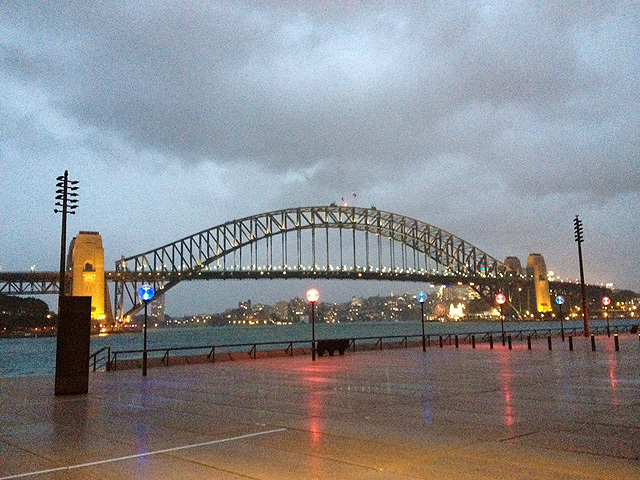 It was a woefully wet afternoon at the Sydney Harbour. Otherwise you can have sunset drinks at the Opera Kitchen (Lower Concourse level, Sydney Opera House) while taking in the great views. I've seen many also hiring a boat on Sydney Harbour. 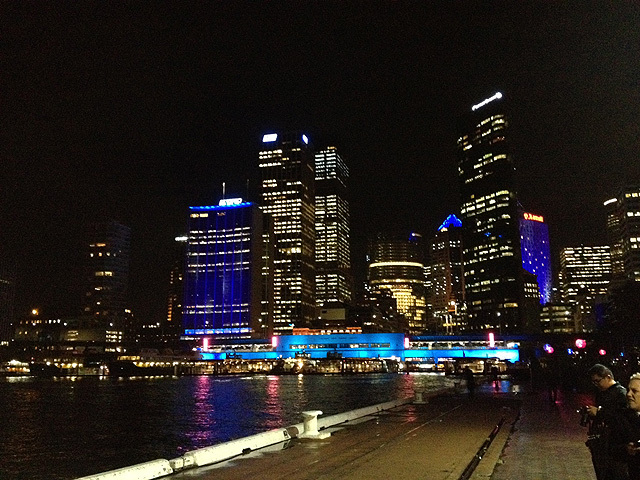 But we were grateful for the opportunity to head back to the hotel to freshen up a bit before dinner at Cruise Restaurant (Level 2, Overseas Passenger Terminal, Circular Quay West, The Rocks; tel +61 2 9251 1118). The restaurant is on the second floor of the bar with floor-to-ceiling windows offering views of the harbour. 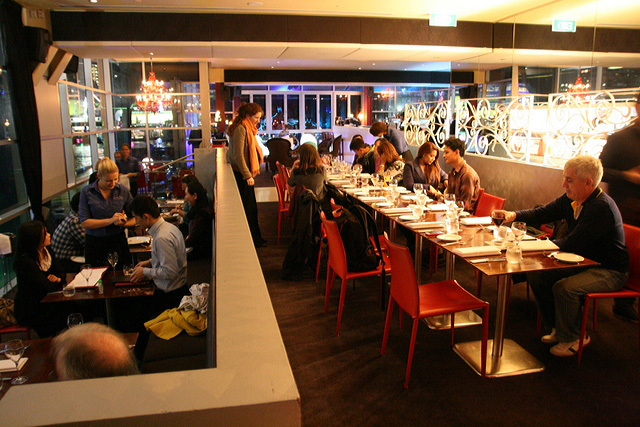 It's an intimate, casual, warm-lit setting you can relax in as you tuck into modern Australian fare. The main attraction here really is the unbeatable harbour view with the Sydney Opera House right across from the Overseas Passenger Terminal. 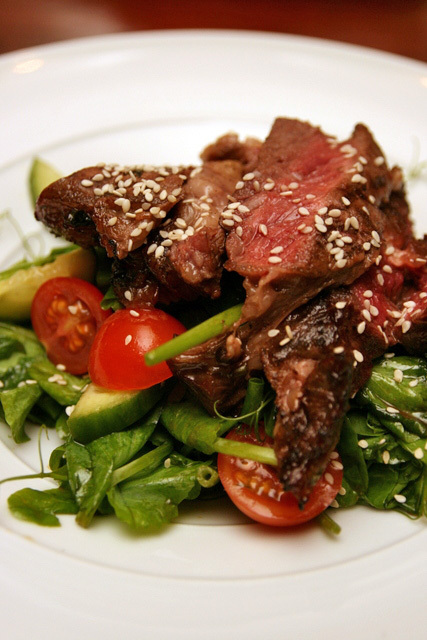 Seared beef salad with snow pea leaves, cherry tomatoes, cucumber, toasted sesame & ponzu (AU$19). We liked this better than the char-grilled squid starter. In fact, the beef here was more tasty than the full Black Angus steak fillet. Grilled King Salmon with miso eggplant and steamed soybeans (AU$35) won the most raves out of all the dishes. 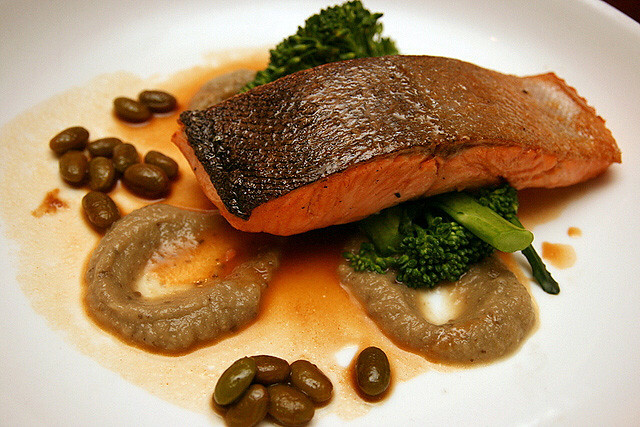 The salmon is incredibly tender and moist; the little braised soybeans bring a seriously salty kick. 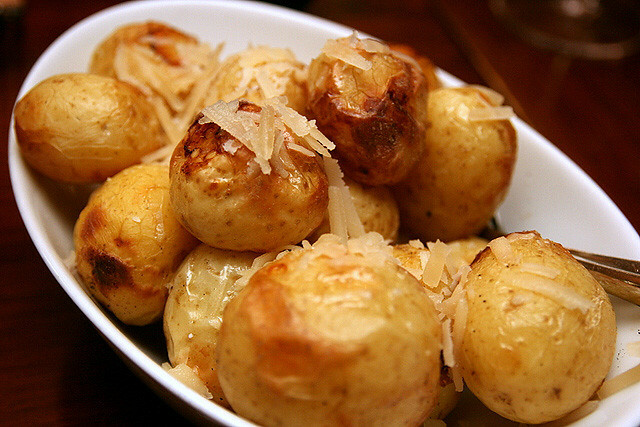 Roasted new potatoes with truffle and parmesan (AU$10). How could you say no to these babies? 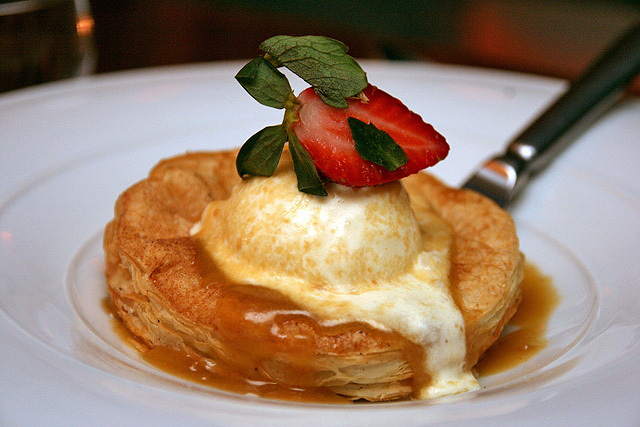 For dessert, French apple tart with vanilla bean ice cream and caramel. So simple but so good. Trust me, you won't regret picking this over the passionfruit creme brulee. We ended the evening with a quick stroll along the harbour before heading back to our hotel, the Amora Jamison, which I will show you in the next post. It was late in the evening, but I still managed to catch up with family in Sydney - hubby's brother, wife and two lovely girls - even if just briefly. With Scoot's affordable fares, I think we can visit more often! So that's Day 1 of the Destination NSW tour of Sydney for media who flew here on Scoot's inaugural flight to Sydney. Days 2 and 3 will reveal more sides of Sydney, including skydiving and vintage shopping! Stay tuned. Looks like you had alot of fun in Sydney.